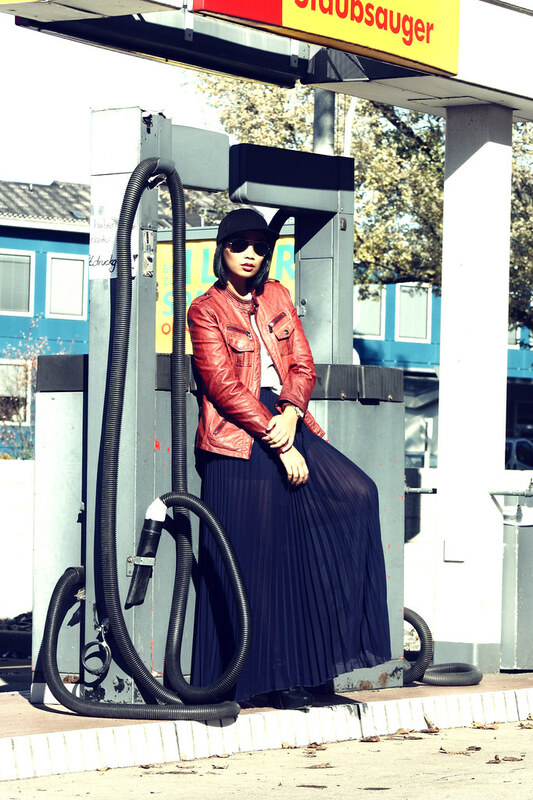 Mode Junkie: AT THE GAS STATION. YES, i jumped on THAT bandwagon. baseball caps for the win! anyway, LOVE LOVE LOVE my new skirt! methinks, australians have their shizz right! i think discovering new brands is one of the best perks of blogging! I WANNA GO BADLY TO AUSTRALIA RIGHT NOW. mainly because it´s summer there & yeah, shopping of course! someone take me to down under please? 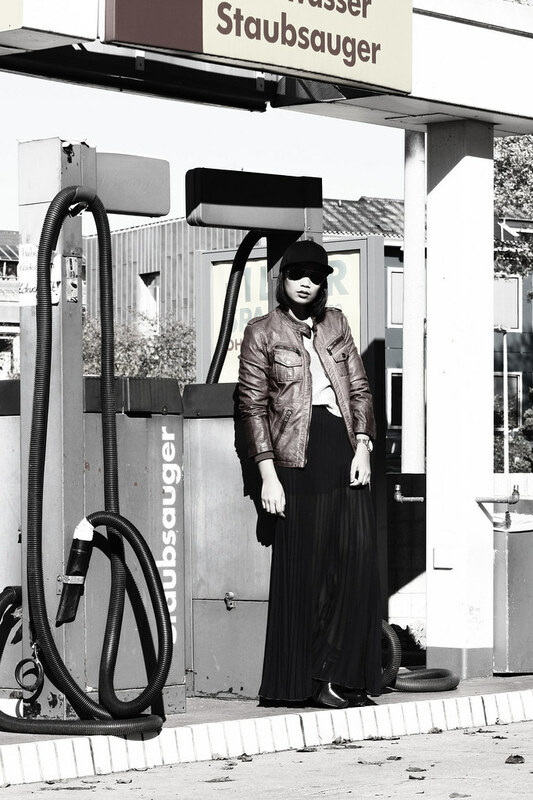 PS: the winner of the Sarenza.DE x Mode Junkie Shoe Giveaway is Camilla from intothefold! 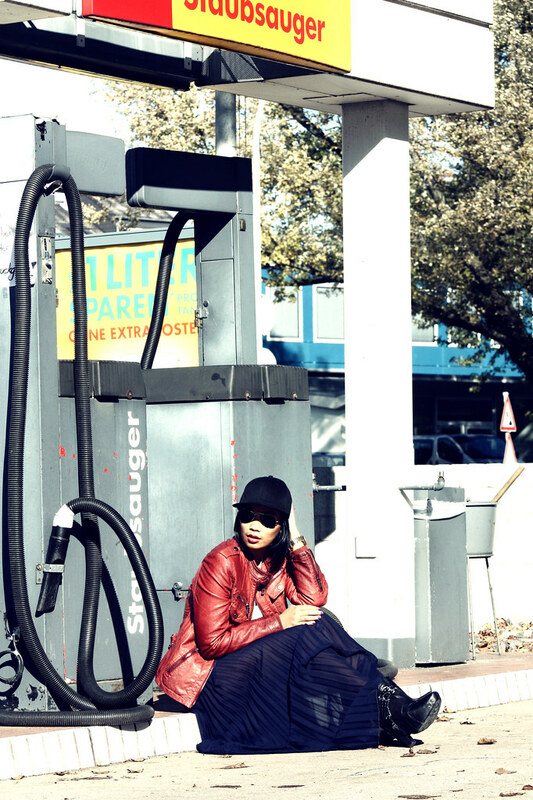 Always love taking photo shoots at gas station, they are the most fun. I want to go to Australia, too! The whole look is just amazing! You, the pictures and the outfit is totally perfect! ahhhhh I love Australia toooooo! These pictures are really amazing!! !i love your jacket so much. amazing photos, you look like a model from fashion magazine, love it! Hi dear! Loving the outfit like always, but had to stop by to give you a thumbs up. I just read your bio with more detail I guess and I found some part of myself in it. It would be something like... Imagine you're 19, you move to Holland living everything you have in Spain, for a Dutch guy not speaking a word of Nederlands... I hope in 6 years I can say I am as succesful as you're, because it's truly inspiring. yay I can't believe I won! Adore this outfit <3 Especially that great jacket. I WANT your skirt !!! I really like this skirt, and the jacket too. Nice style! love the jacket!! cool look!! Ich stelle mir gerade vor, wie viele Leute an der Tankstelle gestanden und dich ganz verdutzt angesehen haben :-D Und nebenbei: Der Rock ist wunderbar! I love the outfit, specially the booties. I saw a similar skirt at topshop and really wondered how it would look... turn out it looks supercool! thanks fpr the inspiration! I think I tweeted yesterday that I don't get the whole caps trend.. I still don't, but you managed to pull it off. And I actually like it with this outfit! And you already know I love the New Yorker video and your blog, of course! This is fabulous,babe!You're rocking baseball cap and the pics are like from magazine! Love the whole look and especially the pleated skirt! Stunning. Dein Rock - herrlich cool! Amazing, love all the outfit! You have a beautiful blue skirt, darling! 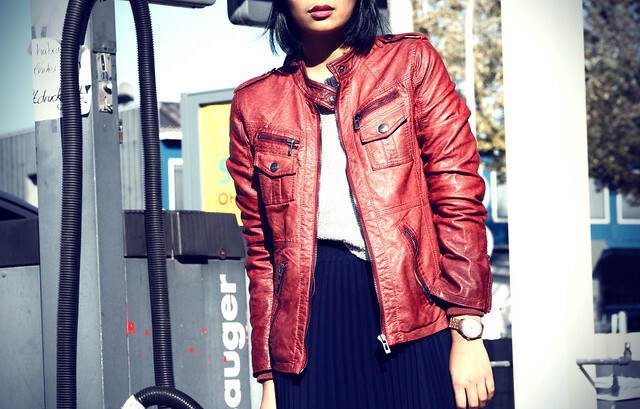 Love that red leather jacket and maxi skirt! Looks so good on you. I never thought that a combination of rugged look and chic style is stylish, eh. Love it!